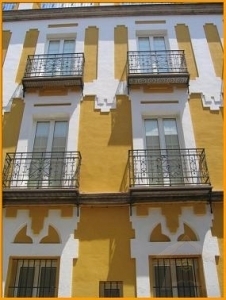 This is immaculate studio in Seville that has been rent by celebrities and world class designers. It has a luxury in the best location in all of Spain. This is truly one of a kind fully furnished studio featuring interior design. All the furniture in the studio is very high end and many prices have been collected by us from our travels around the world. The studio can accommodate up to three people with one queen size beds & 1 king bed. The studio consist of beautiful waterfall in the courtyard with a private and luxurious bed room and spa like bathroom, with special features like Shower, Jacuzzi, Spa tub. Kitchen is fully equipped with all small appliances like toaster, blender, microwave, coffee maker pots, pans and cooking wear and a laundry room with full size washer, dryer, floated station and electric iron. The studio provides you a community swimming pool, which gives an amazing experience of marine world. Rates are $80 per night and can be subjected to change without notice. "So come and enjoy in this one of a kind luxurious state". For reservations over 600,00 euros, holy week and April fear of Seville, we will ask for a 50% bank transaction. We charge 20,00 euros for arrivals after 22:00 hours. Until confirmed rates a subject to change without a notice. You got a double sofa bed and a single bed.